Made By Worms, Loved By Plants, Worm Castings are an amazing, odorless addition to your soil, potted plants, or any feeding program. 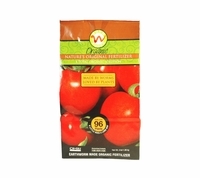 Worm Power is organically certified and is OMRI listed. What starts out as compost, worm castings takes things a bit further. The process of vermiculture helps break down the organic matter even more so that nutrients can be more readily available to your plants. That means quicker results and greater growth for your plants. In addition, there are a multitude of micro-organisms in worm castings that can be very beneficial to your garden's health.